One of the questions I often get asked in both my professional and personal life is “What is Systems Thinking?” It seems like a simple question but the answer can be very different depending on who you’re talking to. Much of my career has been involved in the development of software so it is only natural for a lot of the folks I know to think of “systems” as having something to do with computers. Then there are certain unnamed members of my family who still don’t quite understand what it is I do for a living. And even when I do my best to explain, their eyes glaze over and they claim to get it “sort of”. That’s why I was so excited after I read the book Thinking in Systems – A Primer by Donnella Meadows. Finally there’s a book I can recommend to everyone because it so clearly explains what this systems stuff is all about. I have Chris Soderquist of Pontifex Consulting to thank for recommending Thinking in Systems to me but also for suggesting we collaborate on an online course based on the book. 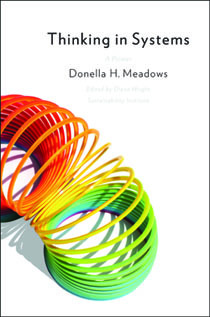 Chris was one of the book reviewers and together with Diana Wright of the Sustainability Institute (the book’s editor) we developed a syllabus for a four-session web seminar series titled Thinking in Systems: Practical Lessons for Building Sustainable Organizations & Communities. Here’s how the online course will work. For four consecutive Fridays in April and May participants will log on to a web site where the course is being hosted. (We use the GoToWebinar service.) During each 70 minute session, Chris and Diana will present materials and provide step-by-step instruction followed by an interactive discussion period. Sessions will be recorded and all of the course materials will be available for download afterwards. We’re really excited about this course because it is so relevant to the headlines we’ve been reading daily and will provide a framework for discussion regardless of your Systems Thinking experience level. If you’ve never done any modeling before, this course will be a great place to start. We’re even offering a time limited student license of iThink or STELLA for course participants. Looking forward to having you join us on Fridays, beginning April 17th.